China Green Buildings: Carbon tax or cap and trade? Yesterday’s thoughts on oil prices got me thinking about how to best price carbon. One of the key problems with oil is the price volatility: just when momentum for alternatives seems to be peaking, oil can fall and make alternatives less attractive. Moreover, the volatility of prices makes long-term business planning and investing more uncertain, and therefore more expensive. I fear a similar dynamic may develop in a cap-and-trade scheme, and therefore am now in favor of a carbon tax. Now that the US is serious about climate change, it will need to get serious about pricing carbon and forcing businesses to internalize the societal costs of carbon that are not currently reflected in the price of fossil fuels. 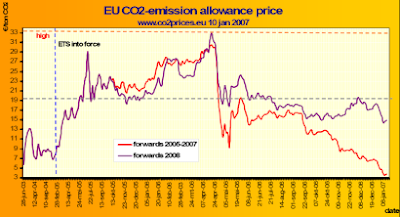 In pricing carbon, we can either choose a quantity of carbon (cap and trade) emissions or we can choose a price of carbon emissions (carbon tax). The nice thing about cap and trade is that we can choose the quantity. We know where we need to be by 2050: 80% below 1990 CO2 levels. So it would be straight forward to just reduce the cap each year until we get to the desired level in 2050. With a carbon tax, on the other hand, we can estimate how much a price on carbon will reduce the quantity of carbon emissions, but we can't know for sure. So on the surface, it seems like cap-and-trade is the best way to price carbon. But here’s the problem: most carbon emissions are going to come, in one way or another, from long-lived assets, be it buildings, factories, infrastructure or autos. The returns from investments in clean and efficient energy will come in part from the avoided cost of energy and carbon prices. As I described in a previous post, investment decisions must meet some sort of internal rate of return hurdle to be accepted. The key thing to note here is that increased risk and uncertainty raises IRR hurdle rates. Therefore, energy and carbon price stability will lower IRR hurdle rates, increasing investment in clean and efficient energy. Now, this data is from Phase 1 of the trading scheme, meaning this is still very much in the preliminary stages. It's possible that this could get better as governments get better at allocating carbon emission permits. But I don't like the idea of price volatility for carbon. Making the price [of carbon] predictable is the most significant move you can make to control global warming. It would tilt literally billions of energy critical decisions toward using less carbon. From a carbon price policy perspective, China is in an enviable position. They clearly need to move toward a carbon price at some point, and the sooner the better. But now that the US is committed to implement some sort of carbon price, China will be able to learn from the examples of other nations and hopefully implement a highly effective carbon pricing system. I think that carbon tax makes the most sense at this point in time, but maybe cap and trade will surprise us. Regardless, the debate over whether to price carbon should be over. It's encouraging to see that the debate in the US has now turned to how to price carbon.